The Kuiper Belt is a donut-shaped region of icy bodies beyond the orbit of Neptune. Because small Kuiper Belt objects were some of the “feedstock” from which planets formed, this research provides new insights into how the solar system originated. This research was published in the March 1 issue of the journal Science. Craters on solar system objects record the impacts of smaller bodies, providing hints about the history of the object and its place in the solar system. Because Pluto is so far from Earth, little was known about the dwarf planet’s surface until the epic 2015 flyby. Observations of the surfaces of Pluto and Charon revealed a variety of features, including mountains that reach as high as 13,000 feet (4 km) and vast glaciers of nitrogen ice. 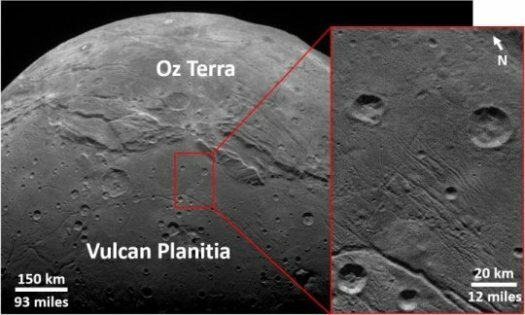 Geologic processes on Pluto have erased or altered some of the evidence of its impact history, but Charon’s relative geologic stasis has provided a more stable record of impacts. 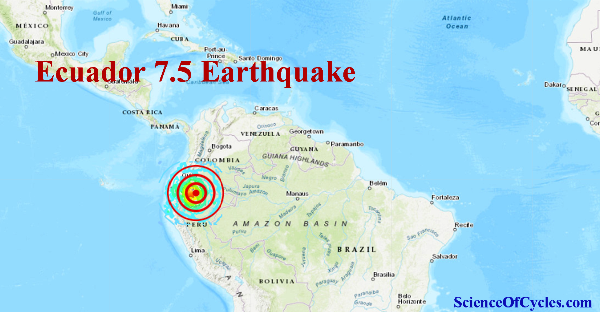 A powerful earthquake struck eastern Ecuador early Friday, sending tremors for miles through a sparsely populated area and into neighboring Peru and Colombia. The quake hit at an intermediate depth of about 82 miles, the U.S. Geological Survey said. The earthquake struck at 5:17 a.m. local time. Its epicenter was 71 miles east-southeast of Palora, far inland and distant from Ecuador’s main highways that run along its mountain ranges. “The Peru-Chile Trench is an area that hosts large earthquakes quite regularly,” the USGS said. It added that 15 other intermediate-depth earthquakes have occurred within 310 miles of the epicenter in the past 100 years. The gaseous layer that wraps around Earth reaches up to 630,000 kilometers away, or 50 times the diameter of our planet, according to a new study based on observations by the ESA/NASA Solar and Heliospheric Observatory, SOHO, and published in AGU’s Journal of Geophysical Research: Space Physics. Where our atmosphere merges into outer space, there is a cloud of hydrogen atoms called the geocorona. One of the spacecraft instruments, SWAN, used its sensitive sensors to trace the hydrogen signature and precisely detect how far the very outskirts of the geocorona are. These observations could be done only at certain times of the year, when the Earth and its geocorona came into view for SWAN. For planets with hydrogen in their exospheres, water vapor is often seen closer to their surface. That is the case for Earth, Mars and Venus. “This is especially interesting when looking for planets with potential reservoirs of water beyond our solar system,” explains Jean-Loup Bertaux, co-author and former principal investigator of SWAN. The first telescope on the moon, placed by Apollo 16 astronauts in 1972, captured an evocative image of the geocorona surrounding Earth and glowing brightly in ultraviolet light. “At that time, the astronauts on the lunar surface did not know that they were actually embedded in the outskirts of the geocorona,” says Jean-Loup. The sun interacts with hydrogen atoms through a particular wavelength of ultraviolet light called Lyman-alpha, which the atoms can both absorb and emit. Since this type of light is absorbed by Earth’s atmosphere, it can only be observed from space. Thanks to its hydrogen absorption cell, the SWAN instrument could selectively measure the Lyman-alpha light from the geocorona and discard hydrogen atoms further out in interplanetary space. The new study revealed that sunlight compresses hydrogen atoms in the geocorona on Earth’s dayside, and also produces a region of enhanced density on the night side. The denser dayside region of hydrogen is still rather sparse, with just 70 atoms per cubic centimeter at 60,000 kilometers above Earth’s surface, and about 0.2 atoms at the moon’s distance. “On Earth we would call it vacuum, so this extra source of hydrogen is not significant enough to facilitate space exploration,” says Igor. The good news is that these particles do not pose any threat for space travelers on future crewed missions orbiting the moon. “There is also ultraviolet radiation associated to the geocorona, as the hydrogen atoms scatter sunlight in all directions, but the impact on astronauts in lunar orbit would be negligible compared to the main source of radiation – the sun,” says Jean-Loup Bertaux. 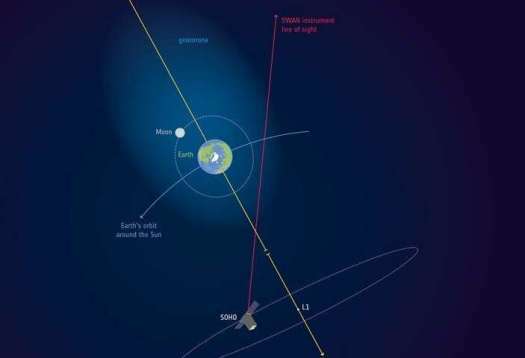 On the down side, the Earth’s geocorona could interfere with future astronomical observations performed in the vicinity of the moon. “Space telescopes observing the sky in ultraviolet wavelengths to study the chemical composition of stars and galaxies would need to take this into account,” adds Jean-Loup. Launched in December 1995, the SOHO space observatory has been studying the sun, from its deep core to the outer corona and the solar wind, for over two decades. The satellite orbits around the first Lagrange point (L1), some 1.5 million kilometers from Earth towards the sun. This location is a good vantage point to observe the geocorona from outside. SOHO’s SWAN instrument imaged Earth and its extended atmosphere on three occasions between 1996 and 1998. Jean-Loup and Igor’s research team in Russia decided to retrieve this data set from the archives for further analysis. These unique views of the whole geocorona as seen from SOHO are now shedding new light on Earth’s atmosphere. Cosmic dust contains tiny fragments or organic material and is spread out across the Universe. The dust is primarily formed in stars and is then blown off in a slow wind or a massive star explosion. Up until now, astronomers have had little understanding as to why so much cosmic dust exists in the interstellar medium, with theoretical estimates suggesting it should be obliterated by supernova explosions. A supernova is an event that occurs upon the violent death of a star and is one of the most powerful events in the Universe, producing a shockwave which destroys almost anything in its path. 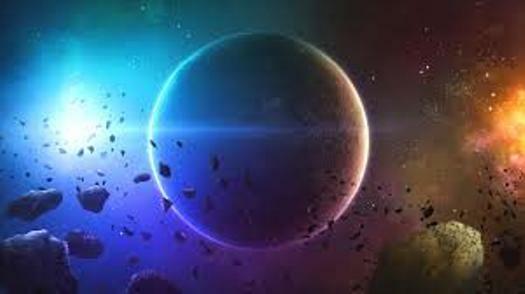 Yet new research published in the Monthly Notices of the Royal Astronomical Society has observed the survival of cosmic dust around the closest supernova explosion detected to us, Supernova 1987A. Observations using NASA’s research aircraft, the Stratospheric Observatory for Infrared Astronomy (SOFIA), have detected cosmic dust in a distinctive set of rings that form part of Supernova 1987A. The results seem to suggest that there is rapid growth of cosmic dust within the rings, leading the team to believe that dust may actually be re-forming after it is destroyed in the wake of a supernova blast wave. This immediacy – that the post-shock environment might be ready to form or re-form dust – had never been considered before, and may be pivotal in fully understanding how cosmic dust is both created and destroyed. “We already knew about the slow-moving dust in the heart of 1987A,” said Dr. Mikako Matsuura, lead author on the paper from the School of Physics and Astronomy. Cosmic dust particles can be heated from tens to hundreds of degrees causing them to glow at both infrared and millimeter wavelengths. Observations of millimeter-wave dust emission can generally be carried out from the ground using telescopes; however, observations in the infrared are almost impossible to interference from the water and carbon dioxide in the Earth’s atmosphere. By flying above most of the obscuring molecules, SOFIA provides access to portions of the infrared spectrum not available from the ground. One of the biggest mysteries of the Sun is why its upper atmosphere—also known as the corona—is over 200 times hotter than its surface. For some unknown reason, this region that extends millions of miles into space is superheated—while the surface temperature hovers around 5,500 degree Celsius, the corona can reach two million degrees Celsius. In a study published in Nature Astronomy, scientists with NASA are now edging closer to understanding this weird phenomenon. 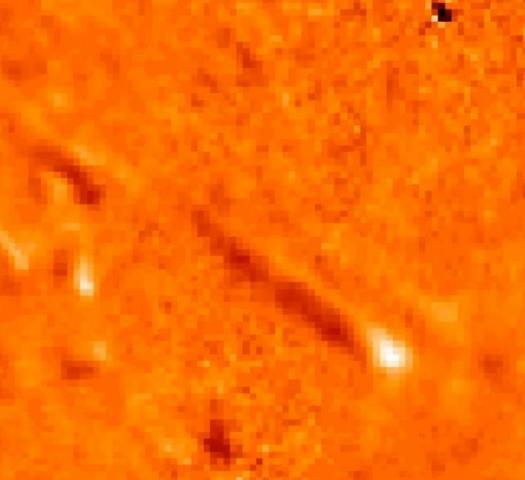 While analyzing data taken by one of the space agency’s solar observation satellites, researchers discovered jets emerging from sunspots and shooting up to 3,000 miles into the inner corona. The jets had bulky heads and slim tails, so they looked like tadpoles swimming through the layers of the Sun. Sunspots are regions that temporarily appear on the surface of the Sun. 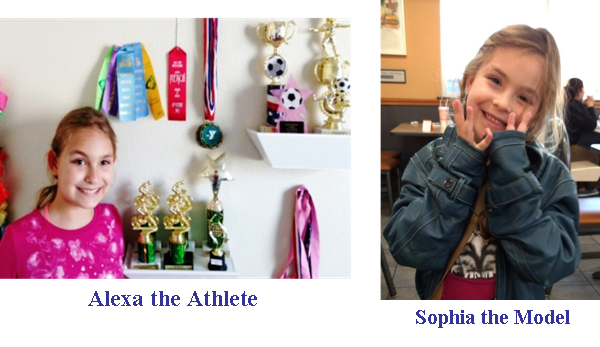 They are much cooler than the surrounding areas and are highly magnetized. Previously, there were two main hypotheses about what was heating the Sun’s corona. 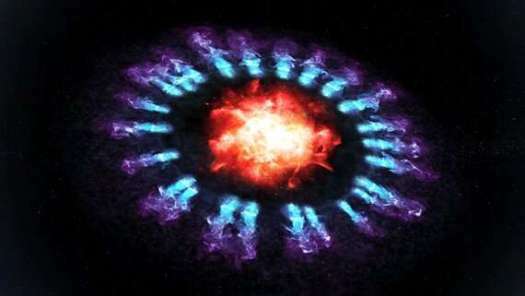 The first relates to nanoflares, where explosions caused by the reconnection of magnetic lines release energy into the atmosphere, heating it in the process. The second involves electromagnetic waves, with charged particles being pushed into the Sun’s atmosphere. The tadpole discovery adds a third possibility to the mix. Scientists found the tadpoles were made up entirely of plasma—the fourth state of matter, consisting of electrically conducting material made up of charged particles. The tadpoles (also known as ‘pseudo shocks’) may help heat up the Sun’s corona at specific times in its 11 year cycle—specifically during the solar maximum, when there is increased activity on the Sun’s surface. The pseudo-shocks are thought to occur when magnetic field lines become tangled and produce explosions. This often happens around sunspots, but may well take place in other magnetized regions of space. Computer simulations showed that the tadpoles could carry enough energy to heat the inner corona. “We were looking for waves and plasma ejecta, but instead, we noticed these dynamical pseudo-shocks, like disconnected plasma jets, that are not like real shocks but highly energetic to fulfill Sun’s radiative losses,” lead author Abhishek Srivastava, from Indian Institute of Technology, said in a statement. The Sun is currently coming to the end of its latest cycle—known as sunspot cycle 24—and will enter the next one at some point this year. As the new cycle begins, sunspot activity will begin to increase before reaching a peak, known as the solar maximum—currently expected to be around 2024. Previously, scientists suggested that sunspot cycle 25 could be weaker than the current cycle, potentially meaning a period of global cooling could ensue. However, this has largely been ruled out, with a team of scientists in India recently predicting that the next solar cycle could be even stronger than the current one.